Why Does The Label Say My Ornamental Chilli Is Toxic? Question: Yesterday a caller to 4BC Radio’s ‘Talking Gardening’ programme asked why the label on their ornamental chilli plant called it Capsicum annuum, and also said that it was “Unfit for Human Consumption”? Answer: chillies are derived from the same plant species as capsicum (Americans call Capsicum ‘Bell pepper’ and the English call them ‘Peppers’), the scientific name is Capsicum annuum. Chilli is hot. Capsicum is not. Both are edible. There are several varieties of chilli which form small, compact bushes which produce a large crop of fruit. Since they grow quickly and look so cute, they are sometimes sold as ‘ornamental chillies’. The cultivar known as ‘Little Elf‘ is quite a popular ‘ornamental’ chilli in Australia. It has distinctive, multicoloured fruit, it’s pretty, it’s edible and it’s quite hot. But there is also a cousin of chilli and capsicum, which is sold as a decorative pot plant. This plant is Solanum capsicastrum (also known as Solanum pseudocapsicum, the false capsicum) and like chilli and capsicum, they belong in the Tomato family (the Solanaceae). Quite a few members of the Tomato family are toxic to humans, and Solanum capsicastrum, the Winter Cherry, is toxic to humans. In Europe and in Australia, the Winter Cherry is traditionally sold at Christmas, and sometimes it is sold alongside edible ornamental chillies, like ‘Little Elf‘. When I ran a garden centre in London, sometimes customers would pull out labels to read them and then they would put them back in the wrong plant, so I had to check stock was correctly labelled. But in this instance the label is incorrect, and the retailer needs to know. All chillies (Capsicum annuum), whether sold for ornament, or for food, are edible. Winter cherry (Solanum capsicastrum) are toxic. Australian consumer laws exist to protect customers and this error in plant labelling should be brought to the attention of the business who is selling these plants. For further information, visit Consumer complaints and queries. 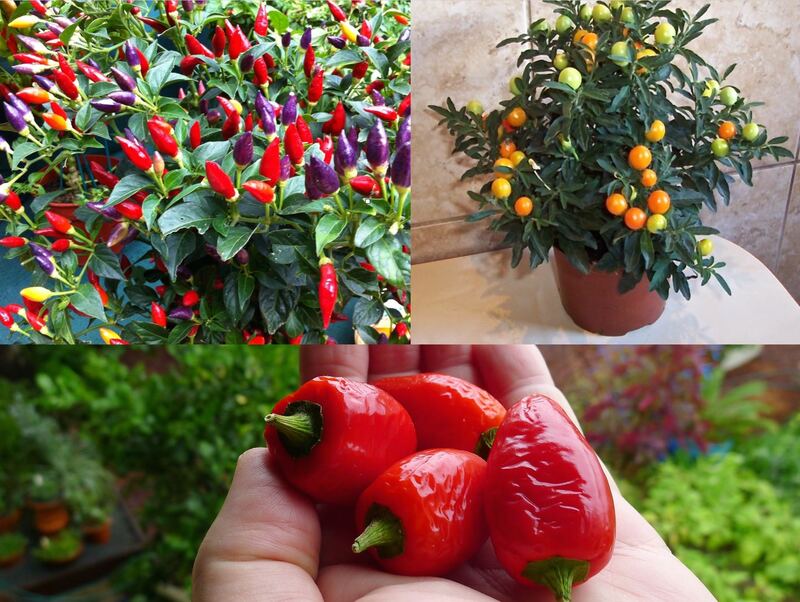 1 edible and ornamental chilli ‘Little Elf’ (Capsicum annuum); 2 toxic Winter Cherry (Solanum capsicastrum); 3 the wild fruit of the edible capsicum (Capsicum annuum). I was told that, while the so-called ornamental chillies were actually edible, they were labelled as not fit for human consumption because of the way in which they were produced. i.e. those for consumption would, hopefully, not have been treated with anything toxic whereas those that were purely ornamental may have been. That seemed to me at the time to be a reasonable explanation of the difference between edible and ornamental. Are you always so brusque in your replies? I wasn’t offering an excuse nor wanting to go into the legalities of labelling … I was simply restating an explanation that I was given at a retail outlet. Hi Jerry, I have been having a conversation with Coles Customer Care about an “Ornamental Potted Chilli” plant producing “ornamental peppers” and labelled as such with no other information as to genus, simply labelled “CAUTION: may cause skin & eye irritation” – no other guidance as to what parts may cause this or if the fruit may be eaten, sold as an ornamental plant in the fruit and veg section of my local Coles earlier this year. I took issue with the labelling and they pointed me to page 16 of the Appendix of the NGIA Labelling Guidelines at http://www.ngia.com.au/Folder?Action=View%20File&Folder_id=75&File=Plant_Labelling_Jan2013_V2_FINAL.pdf which says “Potentially harmful plant genus – includes all species unless specified: Capsicum annum (ornamental cultivars); Potentially harmful plant common name/s: Pepper, Capsicum, Bell Pepper; Required warning: CAUTION Harmful if eaten/skin & eye irritant.” I felt that the labelling was inadequate and possibly misleading, implying that the fruit was toxic without actually stating that. In fact, they came back to me with the advice that “there is no text on the label that states it is toxic” and “these Chili plants were sold for ornamental purposes only and were not meant to be tasted, eaten”. It left me confused and uncertain about eating the fruit of the plant (red, yellow and purple chillis) which look like other edible chillis. I directed Coles Customer Care to your page https://jerry-coleby-williams.net/2014/12/28/why-does-the-label-say-my-ornamental-chilli-is-toxic/ but they ignored that and merely pointed to the NGIA labelling guidelines. NGIA labelling guidelines are, to put it mildly, crap. They protect the retailer not the consumer.